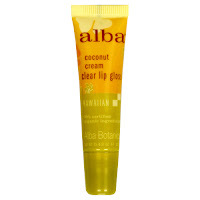 Alba Coconut Cream Clear Lip Gloss: Recently I was looking for a lip gloss that was non-petroleum based. While grocery shopping at the Co-Op, I found myself wandering down the cosmetics aisle - a usual occurence. I picked up a lipgloss that was close to $7.00. I don't know what you're thinking, but I'm thinking that is way too expensive. But a girl needs her lip gloss, so I tossed it in the cart. I continued to wander and I found it - next to the lesser expensive lip balms was Alba Coconut Cream Clear Lip Gloss. I love coconut - check. It has no petroleum - check. 70% certified organic ingredients - check. $3.29 - done. In the cart it goes. Of course I don't wait until I'm home to put it on - I apply my make-up in the parking lot. I tore off the minimal wrapping, turned the rear view mirror toward lips and on it went. Smooth, glossy, & tropical scented - a keeper. Me: I don't know dear, I don't smell anything. Husband: Seriously, what is that stink? Me: Um...it's my Victoria's Secret lip gloss that I'll never wear again. As of now, no observations from husband about the scent of my Alba lip gloss. So far, so good. If you're really into it, buy a 4 pack of Alba lip gloss from Amazon.com for $15.31 (that's $3.83 a tube). Let me know if you decide to give this product a try...I'd like to know what you think! P.S. This is my own little independent review. I'm too small-time to get paid by anybody to review their products. I'll have to try that out! I've used Burt's Bees for a long time (I love the peppermint scent), but I have no idea if it has petroleum in it. Now I'll have to go check! Holy crap, this is hilarious. I am also curious now about Burt's Bees because I have been a long time fan/user of their basic lip balm.